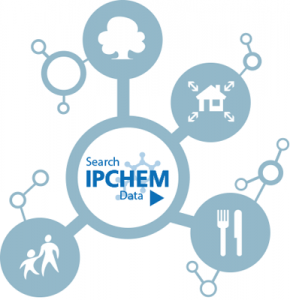 On 11 and 12 December 2017 a workshop was held at the EC Joint Research Centre (JRC) in Ispra, Italy, aiming to discuss the further development of the IPCHEM data platform (https://ipchem.jrc.ec.europa.eu) for supporting the assessment of chemical mixtures. 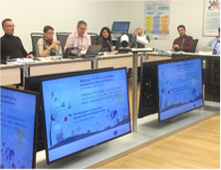 A number of selected experts and the European Commission services (ECHA, EFSA, EEA, DG ENVI, DG RTD) as well as representatives form European research projects were invited and present at the meeting. The European Commission is aiming to have one access point for all chemical occurrence data in Europe. The European authorities EFSA, EEA and ECHA are cooperating on this initiative by contributing relevant data. European projects as for example HBM4EU (https://www.hbm4eu.eu/) will organise their biomonitoring data in the IPCHEM platform. Jacob van Klaveren from RIVM and Hilko van der Voet from Wageningen University & Research presented the EuroMix project and the EuroMix model platfom. It was seen as a complementary tool to the IPCHEM database. The EuroMix presentations were well received. 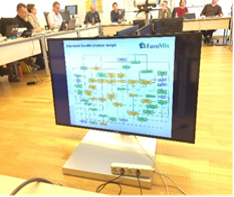 JRC intends to implement web services to facilitate data access from the EuroMix toolbox, and to provide on their website a link to the EuroMix toolbox for performing mixture risk assessments. With the IPCHEM platform we expect that data needed for mixture risk assessment will become available in a more coherent manner. It will include dietary and non-dietary chemical occurrence data as well as detailed properties of chemicals. These developments will certainly boost the discussion on how to maintain the EuroMix tools after the project will end and how to continue to work on the EuroMix concept (risk assessment based on AOP data). It was also discussed how to link EuroMix better to HBM4EU data or how HBM4EU observation might prioritise our next case studies. We will start considering useful links and new case studies soon and plan to discuss these possibilities in the next EuroMix consortium meeting. JRC will make an official communication of this workshop including the presentations given.